Fans of The Sims let out a collective groan when it became known that The Sims 4, released last August, would be missing a ton of features that had long become synonymous with the franchise. Yesterday, that groan turned into a sigh of release when developer Maxis released a patch to reintroduce one of those missing features, swimming pools. 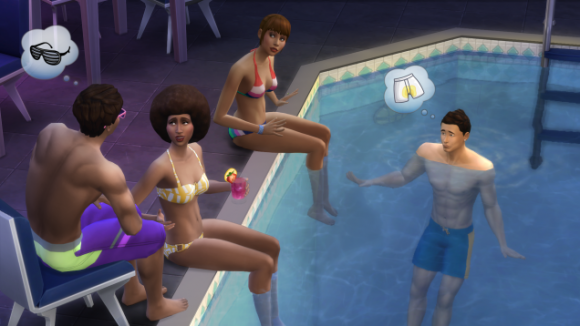 The absence of swimming pools in The Sims 4 led many to not just complain and wring their hands at EA and Maxis, but to also stop and consider why exactly swimming pools were so crucial to the game to begin with. Whatever the reason, their absence, along with that of toddlers, an open world, ghosts, and a million other things led to The Sims 4 receiving middling reviews from fans and journalistic sites, including this one. The official explanation was that the developers spent so much resources retooling the Sims’ AI that they realized they had no time left to work on many other features, but fans were extremely skeptical. A few months past release, EA, proving that it isn’t a one hundred percent evil money-loving corporation, has allayed widespread fears that the missing features would be released as paid DLC and pushed out a slow but steady series of patches to restore them to the game. The first of them restored ghosts to the game last month, along with several free Star Wars outfits to boot. This latest one restores the beloved swimming pool, which can be adjusted both horizontally and vertically and with different shapes. Additionally, the patch includes several swimming outfits to go with the pool, each with their own palette of color schemes. In keeping with the improved AI introduced in 4, Sims can converse and screw around with one another while in swimming pools. You can also construct pools on any floor of your house, and not just in the backyard, and place windows on the walls of the pools to create your own human aquarium. Most importantly however, your Sims are still perfectly capable of drowning in said pools if it pleases you, which should go quite nicely with last month’s ghost patch, you evil, evil person. Along with the watery graves, the patch also comes with a host of bug fixes and tweaks, all of which are available for your reading pleasure here. EA intend to continue rolling out these patches to win back the hearts of its disgruntled fans, so hopefully a few months later, The Sims 4 just might turn out to be the best game in the series.